The white-faced heron (Egretta novaehollandiae) also known as the white-fronted heron, and incorrectly as the grey heron, or blue crane, is a common bird throughout most of Australasia, including New Guinea, the islands of Torres Strait, Indonesia, New Zealand, and all but the driest areas of Australia. 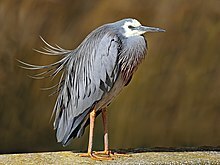 It is a medium-sized heron, pale, slightly bluish-grey, with yellow legs and white facial markings. It can be found almost anywhere near shallow water, fresh or salt, and although it is prompt to depart the scene on long, slow-beating wings if disturbed, it will boldly raid suburban fish ponds. The species was originally described by ornithologist John Latham in 1790. It was historically considered to be closely related to Ardea but for some time it was placed in its own genus—Notophoyx—because of the absence of the plumes typical in that genus. In his review of the family Ardeidae, American ornithologist Walter J. Bock placed the white-faced heron into Ardea, holding it to be related to the white-necked heron, and synonymised Notophoyx. Similarly, Swedish naturalist Kai Curry-Lindahl felt the species was a dwarf member of the genus Ardea. Robert B. Payne and Christopher J. Risley placed the white-faced heron in the genus Egretta due to its skeletal anatomy resembling egrets more than Ardea herons. They noted that Bock had not given reasons why he had placed the species in Ardea, and felt its closest relative was the little blue heron (Egretta caerulea) on account of plumage and skull similarities. Using DNA-DNA hybridization in a 1987 study, Frederick Sheldon confirmed the white-faced heron was a member of the egret clade. The Ngarrindjeri people of the Lower Murray region in South Australia knew it as krawli. 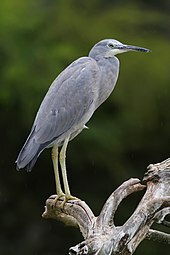 The adult white-faced heron is medium-sized for the family and mostly pale blue-grey. The forehead, crown, chin and upper throat are white. The crown pattern is variable, with the white occasionally spreading down the neck; the variability makes identification of individuals possible. The iris may be grey, green, dull yellow or cinnamon. The regions between the eye and bill on the side of the head (lores) are black. The beak is black and often pale grey at the base. During the breeding season pinkish-brown or bronze nuptial plumes appear on the foreneck and breast, with blue-grey plumes appearing on the back. The adult typically weighs 550 g (1.21 lb) and ranges from 60 to 70 cm (24–28 in) in height. The most common call of the white-faced heron is a gravelly croak or gobble, graak or graaw and is typically given in flight, in interactions or in aggressive encounters. Another call, gow, gow, gow is typically given upon returning to a nest. High pitched wrank, oooooooooh or aaarrrgh calls are given as alarm calls. Breeding generally takes place in the austral spring, but the birds may breed at other times in response to rainfall. Breeding generally takes place in southern Australia, and birds disperse for long distances at other times of year. Both sexes share the task of building the nest, incubating the eggs and caring for the young. The nest is an untidy shallow bowl, made of sticks and usually placed on a leafy branch 5–12 m high, at altitudes from sea level to over 1000 m. When breeding the birds have long feathers (nuptial plumes) on the neck, head and back. A typical clutch has three to five pale blue eggs. with an average size of 48.5×35 mm. Normally only one brood is raised per year. Incubation lasts approximately 25 days. The parents guard the chicks for 3–4 weeks and fledging takes place 40 days after hatching. Typical nestling predators include kookaburras, Australian magpies, hawks and owls. ^ BirdLife International (2012). "Egretta novaehollandiae". IUCN Red List of Threatened Species. Version 2013.2. International Union for Conservation of Nature. Retrieved 26 November 2013. ^ a b c d e f g h i j k l m n o p q r Kushlan, James Anthony; Hancock, James; Thelwell, David (2005). The Herons. Oxford University Press. p. 170. ISBN 0-19-854981-4. ^ a b c d e f g h Pizzey, Graham; Knight, Frank (1997). Field Guide to the Birds of Australia. Sydney, Australia: HarperCollinsPublishers. p. 111. ISBN 0-207-18013-X. ^ Bock, Walter J. (1956). "A generic review of the family Ardeidae (Aves)" (PDF). American Museum Novitates. 1779: 1–49. ^ Curry-Lindahl, Kai (1971). "Systematic relationships in herons Ardeidae, based on comparative studies of behaviour and ecology. A preliminary account". Ostrich: Journal of African Ornithology. 42 (Supplement 1): 53–70. doi:10.1080/00306525.1971.9633397. ^ Sheldon, Frederick H. (1987). "Phylogeny of herons estimated from DNA-DNA hybridization data". The Auk. 104 (1): 97–108. JSTOR 4087238. ^ Clarke, P.A. (2003). "Twentieth Century Aboriginal Harvesting Practices in the Rural Landscape of the Lower Murray, South Australia" (PDF). Records of the South Australian Museum. 36 (1): 83–107. ^ a b McKilligan, Neil (2005). Herons, Egrets and Bitterns. CSIRO Publishing. p. 104. ISBN 0-643-09133-5. ^ Chen, Xiaolin; Chen, Zhihong; Fang, Wenzhen (2000). "Short Communication: New Record of the White-faced Heron Egretta novaehollandiae in Xiamen (Amoy), China". Emu. 100 (4): 340. doi:10.1071/MU004SC. ^ "Species factsheet: Egretta novaehollandiae". BirdLife international. 2008. Wikimedia Commons has media related to Egretta novaehollandiae.